Looking for new name badges? Look no further, because Capitol Medals has an enormous selection of custom name badges to choose from, with several options to personalize them for your specific needs. This simple additional to the workplace can help make employee communication easier, improve customer relationships, and add a measure of security to the workplace. Act now, while Capitol Medals is running a special name badge promotion! Name badges can have several advantages in the workplace, whether at a corporate location or in an environment where employees are interacting face-to-face with customers. Name tags help customers, as well as fellow employees, put a name to a face and also can help people feel more comfortable starting a conversation. It makes learning new employees’ names easier, and by adding job titles, you can also gather information about whom you are speaking with. They add some security to the workplace by making it easy to identify who belongs there and who is just visiting. Your company can also use badges as advertising by having employees wear them at events and special promotions. 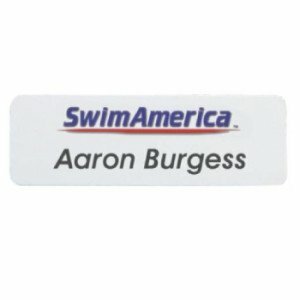 Our online catalog has many name badge options for all types of business. Several materials are available, including plastic, aluminum, brass, and wood. Pick from matte or glossy finishes. Get creative with full color printed nametags with the company logo or other image. Spruce up a contracting business with wood log name badges. Take a look through the store online to order and see what items are currently on sale. Images can be uploaded through the website and a proof will be sent over before anything is printed to make sure you get exactly what you envisioned. 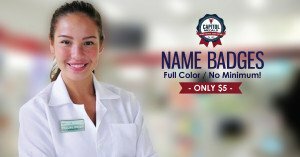 This month Capitol Medals is running a great special on custom name badges. Customers get free art setup when they provide a high-quality logo. Badges are only $5 each and include a magnet back. Choose from 3 different sizes – 3X1 inch, 3.25 X1.25 inch, and 3.5X1.5 inch. Items come in gold, silver, or white metal and have full color printing. Plus, receive free shipping on orders over $100. Get in touch with our helpful customer service department to discuss all the name badge options available. Capitol Medals is ready to help you create the ideal name badges for your company.